The situation. In 2017, there have been numerous instances of off-target movement of dicamba throughout the state of Missouri and beyond. While the majority of the injury on a per land unit area has definitely occurred in the boot heel of Missouri, there are many problems with off-target movement of dicamba in the rest of the state. 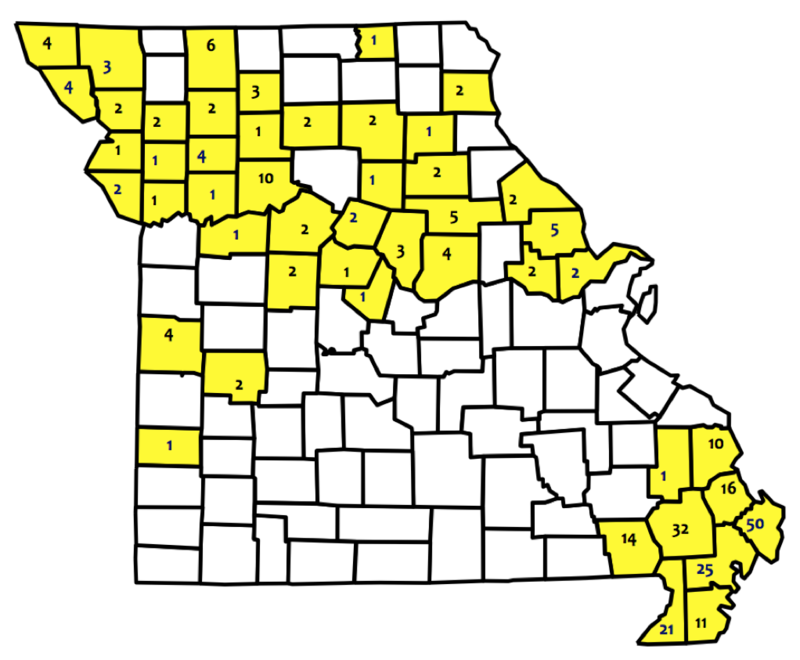 The Missouri Department of Agriculture is currently investigating over 280 dicamba-related injury cases (Figure 1), and based on University of Missouri Extension field visits, we estimate 325,000 acres of soybean injured by dicamba across 54 counties in Missouri. On a national scale, there are now more than 2,200 dicamba-related injury investigations being conducted by various state Departments of Agriculture, and more than 3.1 million acres of soybean estimated with dicamba injury (see our recent update here). In my opinion, we have never seen anything like this before; this is not like the introduction of Roundup Ready or any other new trait or technology in our agricultural history. Figure 1. Official dicamba-related injury investigations as reported by the Missouri Department of Agriculture (updated August 17, 2017). Reasons. In my opinion, there are basically four routes by which dicamba can move away from its intended target, and we have experienced every one of these in 2017. The real debate seems to be about what percent of the total off-target movement should be placed into each one of these categories. First, dicamba can move off-target by way of physical drift at the time of application. This can occur due to spraying when wind speeds are too high, use of improper nozzles that produce fine droplets, or to a host of other factors that we can just chalk up to "bad sprayer decisions or set-up at the time of application." There's no doubt that physical drift of dicamba has occurred this season and that this is one of the major reasons for off-target movement of dicamba. But it isn't the only reason. I have visited and talked with many farmers and applicators who have done it right and still experienced movement of dicamba away from the direction of the prevailing winds at application. A second way that dicamba can move off-target is through tank contamination. This usually occurs due to improper spray tank cleanout. Unfortunately, many have learned the hard way that it takes very, very little dicamba in the tank to cause problems on non-Xtend soybean that are sprayed after a dicamba application. There's no doubt that some portion of our issues with off-target movement of dicamba have been due to improper sprayer cleanout and tank contamination. However, many growers with injured soybean fields didn't even plant any Xtend soybean or spray a dicamba product through their sprayers. Some retailers also have dedicated sprayers for dicamba products only. Another way that tank contamination can occur is through contamination of an actual herbicide product, such as what Monsanto says has occurred with a certain generic glufosinate product. I'm not aware that any trade names of glufosinate products have been put forth or of any actual data presented about this potential problem at the time of this writing, but of course contaminated glufosinate could not explain any of the injury we have seen on Roundup Ready or conventional soybean, or any of the other vegetable or ornamental crops or trees that have been injured by dicamba. A third way that dicamba can move away from its intended target is through temperature inversions. Temperature inversions usually occur in the evening hours around sunset when the air nearest the earth's surface becomes cooler than the air above it. This cooler air forms a stable mass that can be moved horizontally along the earth's surface and then can deposit anything that may have been in it once it dissipates. So for example, if an application of an approved dicamba product is made at 7 or 8 PM into a temperature inversion, any fine droplets that may have been part of this application may not land on the intended target, but instead may be redistributed some distance away once the temperature inversion dissipates the next morning. As a result of our work on temperature inversions over the past several years, our data indicates that we usually experience a temperature inversion at least one-half to two-thirds of the days in June and July, and that these inversions typically start around 6 to 8 PM and persist for 8 to 10 hours. Also as a result of funding from Missouri soybean growers, we now have a network of weather stations in Missouri that are able to tell users whether or not an inversion is occurring. There is some off-target movement of dicamba that occurred in 2017 that can be explained by spraying directly into a temperature inversion, but in my opinion most of our applicators are now very aware of this possibility and have avoided these evening or nighttime applications. However, another possible way that dicamba droplets could end up in an inversion is through volatilization, which brings me to the fourth point. The final way that dicamba can move away from its intended target is through volatility. Dicamba is an inherently volatile herbicide. We know that the older formulations of dicamba are more volatile and are illegal to apply. So if illegal applications of the older generic dicamba products have been applied, I have no doubt that dicamba has moved off-site in those applications through volatility. But in my experiences and discussions with farmers and retailers throughout the state, it does not seem that illegal applications of these older formulations have occurred on a wide scale with any regularity. I do not believe that the scope and scale of this issue can be explained away by illegal applications of older dicamba formulations. As most on all sides of this issue are well aware, both BASF and Monsanto have taken steps and invested a lot of money to make these newly approved formulations less volatile. And they are less volatile. But as many have said, less volatile does not mean not volatile. We have been in the process of gathering volatility data on these newly approved dicamba products for several months. All of our results thus far indicate that we can detect dicamba in the air following an application of Engenia or XtendiMax/Fexapan for as many as 3 or 4 days following the application. University weed scientists in surrounding states are seeing similar results in their research. And so we come to the crux of the matter. I have yet to hear any manufacturer of the approved dicamba products say that volatility is one of the possible ways that dicamba has moved away from its intended target in 2017. But yet many university weed scientists like myself believe this is one of the major routes by which off-target movement of dicamba has occurred, because our air sampling data, field volatility studies, and field visits indicate that to be the case. To say that all of these problems have occurred due to physical drift, tank contamination, or temperature inversions but not volatility is, in my opinion, disingenuous at best. My recommendation. We are in the process of trying to understand how or if these cases can be correlated back to any particular environmental condition such as air or soil temperature, moisture, humidity, etc. That process isn't easy and it can't be done quickly, and any conclusions we can make will only be as good as the data we can get. I'm not sure what that process will yield, but from where I sit right now the only conclusions I can make are that the areas in Missouri that planted the most of the Xtend trait and sprayed the most Engenia, XtendiMax, or Fexapan are the areas where we saw the greatest amount of off-target movement and damage. I know farmers are looking for answers and will soon be making decisions about their traits and weed management programs for next year. So my recommendation for those growers who wish to plant the Xtend technology is to go back to using dicamba at a timeframe and in a manner when it has been used "successfully" in the past. Based on our history of dicamba use in corn in April and May, and even on our experiences this year using these approved dicamba products in pre-plant burndown applications prior to June, we have seen far fewer problems with off-target movement of dicamba in that timeframe than what we experienced in June, July, and August. Even this season I was not notified of any problems with off-target movement of dicamba until early June, and the Missouri Department of Agriculture didn't receive their first dicamba complaint until June 13th. It seems that almost all of the problems with off-target movement occurred once in-crop, post-emergence applications started to be made for waterhemp and Palmer amaranth. Most of those occurred in June and July this season. I wish I had some definite date for a cutoff but at this time I do not; we will be conducting more weather analyses in the coming weeks and hopefully this process will help us understand which factors lead to more risk when applying these herbicides. So for the sake of neighboring non-Xtend soybean fields, trees, vegetable crops, gardens, ornamentals, and our industry as a whole, my recommendation for those who want to plant the Xtend trait in 2018 is to use the approved dicamba products for the control of resistant horseweed (a.k.a. marestail), ragweed species and winter annuals in the pre-plant burndown where these products have a great fit, but to abstain from applying these products later in the season. In Xtend soybean, resistant waterhemp will have to be managed using an integrated approach that includes cultural practices like cover crops, narrow row spacings, etc. along with an overlapping residual herbicide program. For more information on managing waterhemp in different soybean system, see this multi-state publication: Waterhemp Management in Soybean.